-In a large bowl, whisk shrimp ingredients, from olive oil through pepper. -Add shrimp and toss to evenly coat. -Set aside and marinate while you prep veggies. -Combine all veggie ingredients in a bowl. Toss and evenly coat with oil and seasoning. -Transfer to sheet pan and roast 20 minutes; toss halfway through. -Prepare rice and salsa. In bowl, combine rice (or cauliflower rice) with cilantro, slat, and lime juice. -In small bowl, make salsa; combining tomatoes, onion, cilantro, salt and pepper. -Remove veggies from oven and place marinated shrimp evenly among veggies. Return to oven and roast 8 minutes. -Place 3/4 cup rice in each bowl. 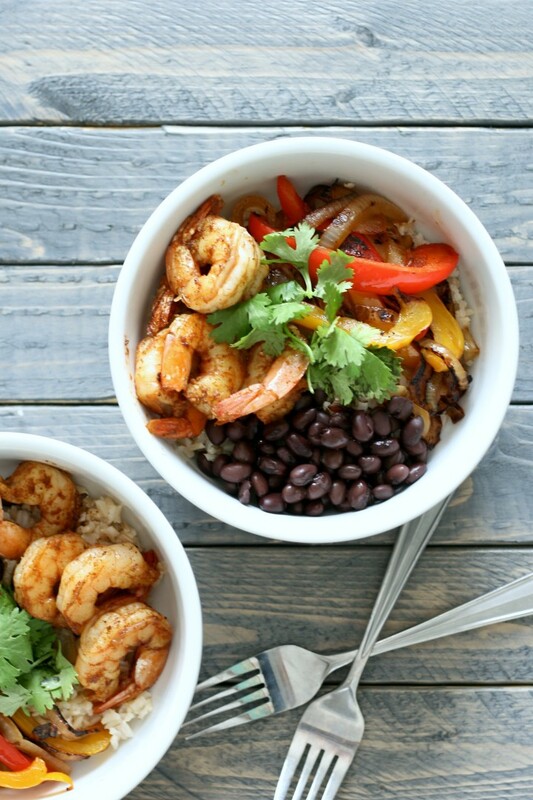 Evenly divide shrimp, veggies, salsa and sliced avocado among each bowl. Serve. SERVINGS: 4 (1 BOWL): CALORIES: 431 (ABOUT 261 USING CAULIFLOWER RICE); PROTEIN: 26gr. ; FIBER: 8gr.